It was held at Osu Park last November 3 on a beautiful day. The IIA booth was so crowded. They sold coffee from Rosenheim City, unique German glasses, and delicious apples and apple juice direct from Aomori. We successfully sold almost all of them with the help of members who attracted customers with a loud voice. The proceeds were donated to IIA. New comers to Japan must take this exam, the same way as the Japanese students. The annual "High school guidance for children and parents who do not speak Japanese as a mother tongue" was held at I & I Hall on October 21st 2018. The Boso Multicultural Network, which is mainly composed of former high school teachers, hosted more than 3,000 people in the span of 17 years. More than 10 active teachers of junior high and high school explained how to prepare for the entrance examination. They also explained about the school districts, examination subjects, interviews, characteristics of the school etc. Fourteen children who must take the tests seemed to be relieved to hear the experience of five senior students, who were able to overcome the difficulties, and now enjoying a wonderful school life. The look on their faces changed after hearing these experience and success stories. On this occasion, NHK came to document this activity and it was broadcasted for over 3 minutes within the news program from 7am on October 31. Ms. Ian Tanaka, who interpreted their explanation was on air. To celebrate 160 years of friendship between France and Japan, “Japonismes 2018” was held in Paris and other cities. At the "Culture of Japan- Festivals and Local Culture" event, Gyotoku Mikoshi (miniature shrine) was chosen as one of the official performers. In collaboration with Ichikawa city, together with IIA corporate member, Nakadai Mikoshi Seisakusho, a group of 27 IIA members joined the Goodwill Tour, visiting France from October 17 to 25. The Mikoshi Parade in Boulogne and the Workshop on assembly and dismantling of Mikoshi at the Japanese Culture Center in Paris were featured. At the Mikoshi parade, a lot of French citizens who came to see it, and it turned very crowded when we started carrying the Mikoshi. We joined the parade wearing Kimono, Hanten and festival towel and we tried our best to carry and follow the parade. People of Issy-Les-Moulineaux, our partner city, also joined the parade together with Mayor Andre Santini. Both mayors, Santini and Murakoshi joined the festival celebration. We also enjoyed sightseeing in Issy city and Paris. At the welcome ceremony hosted by Issy, titled, "Japan Memorial Evening", Japanese animation and comics were featured. We made exchanges with Issy people by making Origami together. We enjoyed delicious French foods such as galettes, crepes and a splendid French cuisine at a dinner invitation. To express our appreciation, we offered tea ceremony and Origami lesson. We wonder if we were able to extend our courtesy enough to Issy people through these activities. Nevertheless, each one of us worked hard to deepen our friendship and we are confident this visit would strengthen our mutual understanding and cooperation - celebrating Japonismes 2018 together, carrying Mikoshi together, and sharing French/Japanese culture together. After visiting Issy City, the party also enjoyed visiting the beautiful towns of Mont Saint Michel, Honfleur, Rouen and Giverny in Normandy region. It was the first time for IIA to install a booth at this annual Gyotoku festival. The international exchange area was provided to promote exchanges with non-Japanese residents in the Gyotoku Ekimae Park. Members of Foreign Residents Committee performed Bolivian Dance and Philippine Bamboo dance. We sold German coffee and introduced the activities of IIA. We hope this participation would contribute to international exchange in Gyotoku. IIA hosted a welcome party for 9 delegates from the state of Wisconsin, USA on November 29 at the Ichikawa City Cultural Center. Chiba Prefecture and Wisconsin State (hereinafter, W State) have concluded Sister Prefecture/States Agreement in 1990 and are interacting with each other. With mutual visits every other year, 12 people from W State visited Kisarazu City this year. They visited and interacted with citizens in various places in the prefecture. As Minami Gyotoku Hana Gumi (Yosakoi Soran Dance team) was selected as a delegate to W state next year and IIA will accept W State delegates in the following year - an arrangement that was set up quickly. Yosakoi Soran,Dance team and African Dance Company of W State showed up dancing to the beat of a mixture of drums. This lively dance of West Africa excited all attendees in the venue. This class is being held every summer, for the 12th time this year, to support the new comers to Japan. Twenty five students from China, Philippines, Thailand, Indonesia, Nepal and India had fun learning Japanese on Aug. 26th at Ekinan Kominkan. They started out by making self-introductions showing their national flags. Then, they learned the names of school items in Japanese using picture cards. After this, they took the bus to the Western Chiba Prefectural Disaster Prevention Center to learn how to prepare for the disasters. They seriously experienced the earthquake, big storm, and the use of fire extinguisher. The participants said it was a great experience to prepare for the disaster. From Aug 21 and 30, 2018, a delegation of 9 students and 1 chairperson from Medan visited Ichikawa. They stayed at Omachi Shonen Shizen-no-ie on the first night, and at their host family houses for the rest of their stay. Their busy itinerary included Ichikawa City hall, Chiba University of Commerce, Kokubun High School, Tokyo Disneyland, Karuizawa and many more. Their most favorite place was TDL and their most favorite food was tempura. IIA hosted a farewell party on Aug 29 with more than 90 attendees. Medan students performed a local dance with colorful costumes and we danced the New Olympic Ondo together. From August 2 to 11, 2018, high school students, 1 chaperone from the IIA Students and Youth Committee together with another chaperone from city office were dispatched to Gardena. The committee supported them in 7 preliminary training workshops, running a debriefing session after trip , and a compilation of report booklet. 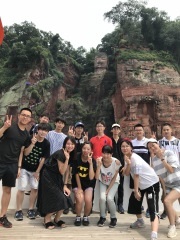 High school students stayed in host families' residence for seven nights and experienced the American life. They visited the Mayor office and the city council as well as library, sister city parkett, museum, famous tourist spots, theme park, major league ballpark. They also enjoyed getting touch with local children at summer camp and local students at pool party. IIA is working hard to “Prof. Chef Program” which is sponsored by the City after 2016. It is a part of the international understanding class for 6th grade in primary schools in Ichikawa and deepens multi-culture understanding through international cuisines. Fourteen foreign chefs worked cooperatively and 25 schools were involved to this program in this two years. They cook their countries’ simple but authentic foods, while wearing their local clothes or toque blanches. Now, tasting time. It is the very excited exchange time, hearing about things of chef’s country and comparison of the foods between two countries. The members of IIA chairpersons gathered at the Osu Disaster Prevention Park on March 11, 2018 to renew the importance of the disaster prevention. We first understand the hidden function of this park when an evacuation happens. Then we learned treatments when a disaster occurs using the disaster prevention map of each region in Ichikawa. There were thirty foreign people gathered for this purpose in this park and got the training of disaster prevention drills together. We reconfirmed the importance to implement a disaster prevention activity proactively working together with foreigners. Japan Day 2017 was held around the Chuo Kominkan on November 4th, 2017. The theme in this year was “Dou” or Japanese spirits on sports and culture. It is not only for being stronger and expert, but getting in higher spiritual world. We decided to demonstrate Aikido (Weaponless self-defense) , Kendo (Japanese Fencing), Kadoou (Flower arrangement) , shodo (Calligraphy), sadou (Tea Ceremony) as well as traditional Japanese activities, Shamisen (Three-string music instrument), Shishimai (Lion Dance) and Rice pounding. Ichikawa citizen festival was crowded with more than 200 booths including IIA at the Osu park on October 8th and 9th, 2017. It started by the music band of Ichikawa FD and baton twirlers. The Gardena Delegation happed to visit Ichikawa and was introduced at the opening ceremony. It performed Mikoshi and Kiyari, Japanese traditional demonstrations, following the ceremony. Ladies wearing Japanese Kimono served teas to people from Gardena in this booth, being decorated by the traditional big red parasol and carpet. In the same booth next to this tea room, our friends from Peru and Bangladesh were selling unique products from their own countries and very popular among visitors. In the tent of IIA, we sold the coffee of Dallmayr's which has more than 300 Years history. The warm delicious coffee was very popular. And the powder of the coffee of the Dallmayr's company was also very popular and sold out immediately. Kaiyuuten, becomes an annual event, was held at Motoyawata area on September 23rd and 24th, 2017 and IIA set up an international exchange booth. Cross Cultural Exchange and Foreign Residents Committees opened “International cuisines” at Keiyo Gas Hall to cook and sell foods of Paraguay, Thailand and Taiwan. They were delicious and sold quickly. Our friends from Peru and Philippines sold their traditional souvenirs and accessories out of this building, chatting with passers-by. It seems to spread pleasure of exchanging with foreign people. “Survival Japanese Language School” was held on August 19th and 20th, 2017 at Motoyawata and Gyotoku. It aims to assist pupils, who are very new in Japan and hard to speak Japanese. We hoped them to get in the second trimester smoothly after joining this special occasion. Many pupils and volunteers gathered and learned Japanese hard. They studied mathematics, clock, school time schedule and easy verbs in Japanese on the first day and we went to the school trip to the Ichikawa History Museum and learned how to act for disasters on the second day. IIA collaborated to the Summer Program of Chiba University of Commerce (CUC) , teaching Japanese economy and culture, while dressing Japanese summer kimono “Yukata” to foreign students on July 26th, 2017. 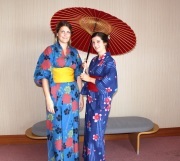 We prepared more than 50 sets of Yukatas and more than 20 people cooperated to dress Yukatas to students. The comment of a student was “Beautiful, I like it” with charming smiles. It was held at the rose room of the Ichikawa Bunka Kaikan on February 25th, 2017 and more than 130 members participated. It began from the greetings made by Ms. Naita, the president of IIA, Mr. Okubo, the mayor of Ichikawa and Mr. Inaba, the president of the municipal assembly. After the introduction of guests, testimonials were presented to persons and organizations, which contributed to IIA gratefully. The party started from beautiful sounds of a violin and a piano. They were talking about old sweet memories and the book published this time while eating the many countries foods lunch box cooked by our members. The last program was the exotic dynamic African dance which was played by Tokyo Goru Goru. The party was over while we were promising to keep evolving for IIA. Students graduate middle school in 2016 and their parents were awaiting eagerly for this High school guidance held at Gyotoku I&I hall on September 25th 2016. This guidance is for the people who don’t know high school entrance examination system and explain the system and help them how to succeed to pass this test. It was coordinated by Boso Japanese language Volunteer network and 60 IIA volunteers participated. We were glad to have heard that one of the parents was so relieved and relaxed to have known the system and now was confident to prepare for the test and high school life. IIA participated to the 41st Ichikawa Citizen Festival which was held at Osu Disaster Prevention Park demonstrating IIA activities on November 3rd,2016. We have sold fresh apples from Aomori directly, Dallmayr coffee and super-balls-piking-up by the Youth Group. Many people stopped by at IIA booth including Mayor Okubo and city reps. There were 125 groups in the festival field and total 172 groups joined this festival. We saw Gyotoku Mikoshi (Portable shrines) as usual, brass band and Ichikawa girls , so it was so crowded and popular. IIA members showed the great team work to work on and communicated with other members and citizens closely. The Triple Fret, the lady guitar trio in Philippines, played at the rose room in the Ichikawa Bunka Kaikan on June 17th 2016. They have started to play Sakura, Japanese song, and then Philippines’ folk songs, Spanish guitar songs and Beatles hit songs. It was so heated up on the stage, decollated by our idea. After the concert, we enjoyed chatting and playing with singers. The large scale disaster prevention drill was held at the 7th middle school on August 28th 2016, prior to the disaster memorial day of September 1st. It gathered 10 fire engines, disaster support vehicles of SDF and police cars. Eleven IIA members and 6 foreigners have experienced evacuation in smoke, manmade earthquake vehicle, fire extinguisher usage and AED trial. They have also watched dogs’ activity to search survivors in a broken house. They, then, moved to the Onitaka primary school to experience the evacuation shelter. They became evacuators after registrations and acted many jobs to help each other in it. It ended after receiving hot meals cooked at sight. The foreign participants were so glad to have experienced this valuable drills. One of the biggest events in this summer was held at the 7th junior high school between August 23rd and 24th ,2016. It was the first time that a part of the program was cancelled due to typhoon and it was condensed two-day curriculum into one day. It was participated by 40 pupils of 10 counties, China, Philippines, Nepal, Indonesia, Guatemala, Thailand and USA. The themes were words which are used in school and to know Ichikawa and the location of their houses and addresses using maps. The second day was the school trip, going to Sakaeya, the confectionary factory, and the western prevention center in Matsudo. Sweet coconut flavor pervaded in Tokagi Primary school on June 1st, 2017. Spicy curry croquette flavor in Fukuei primary school on June 25th. The special program called “Teacher Chef” the city coordinates started in this year. Its concept is to cook foreign cuisines together with foreign chefs and pupil and learn international matters. This program will continue at all of the primary schools in another four years and grow real international personality. IIA is pursuing this with full cooperation. It was held on April 24, 2016 at Kinro Fukushi Center with more than 130 members. There were three parts. First part was the report of 2015 results of the activities and the plans of 2016. The second part was the lecture presentation of Mayor Okubo. The third part was the fun meeting among members. The traditional Taiwanese dance team by Ami Tribe was invited and performed beautiful dance. It was the fruitful 4 hours to think about our capabilities for foreigners and exchange activities. More than 300 people gathered to celebrate New Year at Kinro Fukushi Center on January 24, 2016. It began by the Japanese tradition, the Lion dance or Shishimai and enjoyed to eat rice cakes or Mochi. There were many kinds of international cuisines such as Philippines, South America, China and India. On the stage, there were international dances, Philippines music, Kimono fashion show and speech contest. We spent one marvelous international day. IIA had the booth in this festival held on November 7, 2015 at the Osu Park. Rosenheim City official delegation was welcomed and enjoyed watching Mikoshi or portable shrines, and eating typical Japanese foods. They visited IIA booth and made close communication with our staffs. IIA sold Rosenheim beers and wataame or cotton candy at the booth. The Division of International Relations, Ichikawa city, surveyed questionnaires to improve international relations. It is planned for the parents and children who are not familiar to the Japanese high school systems on October 12, 2015 at I&I Hall. Teachers and students in high school explained systems, entrance examinations and characteristics of high schools and made them relieved. It was held for children, who don’t use Japanese often in home during summer vacation, between Aug. 24 and 27, 2015 at Ichikawa 7th Middle School. More than 40 children joined this special occasion to study Japanese and went to trip. They enjoyed making a broach and seeing the night sky in the planetarium, and moved to Western Disaster Prevention Center to learn how to minimize the damage. IIA supported Ms. Takeuchi’s lecture, the leader of Ehime Global Network, on June 10, 2015 at Chiba University of Commerce. She is active to collect weapons scattered during the civil war in Mozambique and change them to the arts appealing to peace. Nepal quake caused serious damages, 8,500 dead, 15,000 injured and 8million victims, which is 30% population. IIA held the charity activity supporting Nepal and donating after eating Nepal curry at Ichikawa Kominkan on June 28, 2015. 100 IIA members gathered. Nepalese and IIA members were working together to make real Nepal curry, have them eat and ask them donation if delicious. The total amount of donation was \180,000 and donated on site to the damaged primary schools in Nepal. It was held on April 11, 2015 at Kinrou Fukushi Center with over 120 IIA members. It was approved for activities, financial report and amendments of the byelaw in 2014, activity plans and financial plans 2015. The new chairperson, Ms. Narita and vice chairpersons, Ms. Inoue and Mr. Nagaosa were selected and approved. IIA will perform strongly exchange activities with sisters, friendship and partner cities ,survival Japanese school and other activities. After the assembly, Mayor Okubo explained municipal government. The last session was the social gathering. The Korean performers played the Korean drum, dances and songs while enjoying eating our own prepared lunch. This training was held at I-link tower and Osu disaster park with more than 70 people. Mr. Takahashi, the manager of multilingual living of CLAIR talked about problems which foreigners face against when the quake occurs. Mr. Fujita, the officer in Ichikawa City, spoke about preparations when disasters occurs in Ichikawa. Ms. Bannai, the International Language Academia explained how to write easy Japanese. The main session was scenario training against the disaster how to act when the disaster occurs. We felt seriously to prepare against the disaster. It was raining in the morning on November 1st, 2014, however it recovered when the opening ceremony started at 9:45am. There were four fields, Viva Ichikawa Field, Festival Field, Bazar Field and Kids Field. IIA promoted distributing the pamphlets of IIA and selling the wata ame (cottony sugar) and popcorn under two tents. The international Exchange Div. of Ichikawa City held the booth next to IIA and appealed exchange activities with five cities and had questionnaires about the international exchange. It was held on October 26th, 2014 at the Green Studio, Media Park Ichikawa, as a part of 20th Onitaka Sansha Festival and more than 250 participants enjoyed. The events on the stage: Speeches in Japanese by the foreign residents, Korean Dance, Indonesian Civil Dance , Chilean Dance, Filipino Civil Dance, Songs by the sopranist and Children’s chorus. The town of Yawata was chosen as the area of the excursion display in Ichikawa City this year. It has been held around Yawata Shrine, Shimin Danwashitsu, Yawata Primary School and surrounds on Sep. 20 and 21, 2014. IIA held the booth to introduce the activities at Shimin Danwashitsu, sold Asian and South American merchandizes at the restaurant Marche, and demonstrated the Filipino Dances at Yawata Primary School. It was held at Ichikawa 7th Middle High School between Aug. 25 and 27, 2014 with 48 pupils of 11countries in primary and middle high school. The purpose of this class is to encourage them to start the second semester of the school smoothly afterafter studying Japanese pleasantly at this class. The theme of this time was to get familiarize themselves the Japanese languages which used at home and school very often. The third day was the trip to Odaiba. We learned refraction and reflection of light and three primary colors at the Panasonic museum and how gas is mined and sent to our home at the Gas museum. This class is supported by many volunteers who worked hard to put ideas outs, make the materials and teach them. IIA’s General Assembly 2014 was held on April 26, 2014 at the large conference hall in Ichikawa Kinrou Fukushi Center. More than 100 members including the city hall officers gathered. 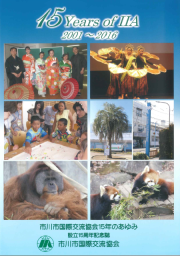 This year is the important milestone for IIA to celebrate 80th anniversary of the foundation of Ichikawa city, 25th anniversary of Ichikawa-Medan sister-city affiliation and 10th anniversary of Ichikawa-Rosenheim city partnership. We discussed about the business report and result of 2013, the business plan and budget of 2014 and the new board members. All these agenda were approved at the meeting. After the meeting, Mayor Okubo made a memorial speech of the current condition and future plan of Ichikawa which we are very interested in. Unfortunately, it was raining on the International Day which was held on Oct. 20th, 2013 at the Gyotoku Bunka Hall. Some of the events, scheduled outside, were cancelled, however almost all events were carried out. There were a performances of chorus, dancing, speech contest and introduction of typical Japanese cultures such as tea ceremony, paper holdings and kimono wearing. We also learned how to prepare for disasters and crimes. Of course, we tasted foreign cuisines. There were many IIA members and Ichikawa citizens with their families. They really enjoyed one day. Many people gathered at the Colton Plaza on October 6, 2013 for the German Day 2013 which was scheduled to match the October Fest in Germany. . People were enjoying drinking amber color beer with white foam and eating sausages At the plaza there were many booths prepared to exhibit the panels to introduce Germany, to sell the German wines and to demonstrate the German cars. It looked like Germany here. We worked hard to introduce the city of Rosenheim and distribute the leaflets as IIA will celebrate 10th anniversary of Ichikawa-Rosenheim city partnership next year. It was the 7th year since we started this program which offered the opportunity for non-Japanese children to learn Japanese pleasantly. 41 pupils from the primary and middle high school and 40 volunteer teachers attended the 3-day curriculum on Aug. 26th, 2013. The theme for this year was “Four seasons”. They learned the way how to read and pronounce the month and day, languages related to seasons, plants, insects, foods, regional festivals and haiku. We went on an outing to the subway museum and aquarium on the last day. The kids joining to this special occasion said it was very valuable and memorable days. The volunteer Japanese language classes hosted by IIA were used to hold mostly for adult learners. Meanwhile, the numbers of children are increasing recently and the demands of establishing the Japanese learning system for them are getting stronger. Then, IIA decided to open a course “The Japanese Language Class for Children” in fiscal year of 2013. The class is targeted to kids in northern part of Ichikawa City where is along the JR Sobu line and north because of the people’s strong demands in this area. The goal of this class is to live smooth school life for foreign elementary and junior high school students. copyright©20XX Ichikawa International Exchange Association all rights reserved.